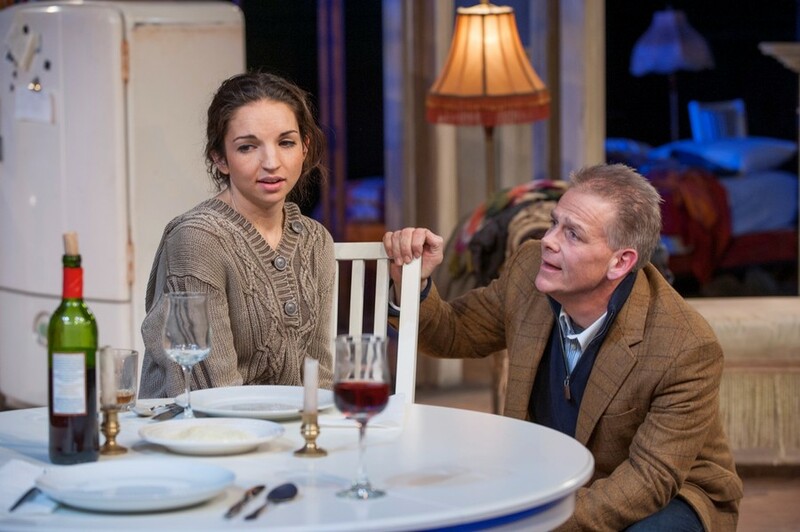 “There are no tricks [in Skylight]…Really, we sit in this room with three people all night,” director William Brown says in the play notes to Skylight, which opened at the Court Theatre on January 10. The simplicity of this premise sounds appealing and potentially deeply profound, but belies several flaws in terms of holding the audience. Skylight is performed by three actors: Laura Rook as Kyra Hollis, Matt Farabee as Edward Sergeant, and Philip Earl Johnson as Edward’s father, Tom. One afternoon, Edward visits Kyra, surprising her after she has been absent from the Sergeant family for years. He tells her that his mother has died and his father is not well. Shortly after Edward leaves, Tom drops by. The result is a confrontation between Kyra and Tom about what happened to the Sergeants because of their affair, and an unveiling of the deeply-rooted problems underneath their relationship, both past and present. There is also a clash between Kyra’s idealistic notions and Tom’s pragmatic money-making life philosophy. The play takes on an inexplicable, distinct socioeconomic angle as it continues. Kyra questions Tom’s life, which has been focused on money; he has provided for the people he cares about in the only way he knows how: by buying things. He roars at Kyra that he can have a fresh wheel of cheese delivered to her door every week when she asks him to grate her paltry, none-too-fresh chunk. Shortly afterward, the two of them get in a shouting match over Tom’s driver, who has been left sitting in the car in the cold outside Kyra’s door because that is, as Tom sputters, his job. Tom came off as incredibly old-fashioned and unappealing, although perhaps the fact that I was surrounded by liberal-leaning college-age students didn’t help. Edward does not rescue the play, either. Farabee’s English accent makes him sound thickheaded and foolish, and the vague, superficial speeches of his young adult character (“She’s the only girl who’ll sleep with me”) sound forced. When Edward surprises Kyra in the first act, the shortness of his visit and the comedic relief offered by his well-intentioned but dull comments and the slight glimpse into his troubled family life leave the audience intrigued enough to hope for more. Indeed, the opening of the second scene, when Kyra’s doorbell unexpectedly rings, is promising. But ultimately, this middle section of the play drags, and is where the weakness of the play is most prominent. Hollis and Johnson get repetitive as they dance around one another and speak about the most mundane things in a forced and stilted conversation that is tiring for an audience to listen to. In addition to all this there’s nothing redeeming or relatable about Skylight. The moments of intensity (shouting matches, revelations, truths torn out of the actors’ mouths) as Tom and Kyra circle one another increasingly closely do arouse empathy—for example, when Tom flatly says, “You suffer. That’s what you do. There are no shortcuts. There are no easy ways.” Yet such moments are too few, and there is too much distance between the characters and the audience to warrant true engrossment. Watching Skylight is an experience akin to sitting in on a conversation between distant relatives who are energetically discussing events and people of the past. Sometimes the stories are interesting, sometimes the conversation is intriguing, but overwhelmingly there’s little to connect or relate to.